5 tips to writing readable Blog Posts! - Mundy Media Group Inc.
Reading from a screen can be hard. Writing readable Blog Post is important if you want your readers to read your entire blog post, you should make sure your post is easy to read. Posts that are nice and easy to read will result in more returning visitors and a higher conversion rate. In this post, I’ll give five tips on how to improve the readability of your articles. 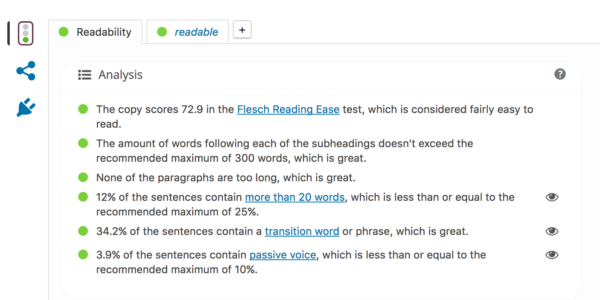 To help you improve the readability of your post Yoast SEO now offers a readability check! At this moment it’s fully available for English and German, and partly available for all other languages. The most important advice I would give you is to make sure your text isn’t too difficult for the audience you’re writing for. If you write about LEGO and focus on kids, your text should be easy to read. But, if your audience consists of scientists with a Ph.D., your text could be much more challenging and still be suitable. The five tips I present below should thus be seen as general rules. For some audiences, a text could be made even simpler, while for other audiences the rules will be a bit too strict. Make sure to write clear paragraphs. For a blog post, we would advise you always to start your paragraph with the most important sentence. Then explain or elaborate on that sentence. This way a reader will be able to grasp the most relevant content from your article, just by reading the first sentences of your paragraphs. Make sure paragraphs aren’t too long (7 or 8 sentences is quite long already). Try to write short sentences. Short sentences are easier to read and understand than long sentences. Above that, you will be less likely to make mistakes in grammar as your sentences are rather short. We consider sentences containing more than 20 words as lengthy. Try to limit these long sentences. Make sure you only have a few sentences in a blog post that count more than 20 words. Also, make sure a paragraph doesn’t contain more than one long sentence. Of course, in some cases, your blog post just is about something that’s hard to explain or requires a more advanced vocabulary. Just a few weeks ago, I wrote a post about illustrations. Illustrations is a word containing four syllables and can, therefore, be seen as a difficult word. Still, I had to use that word (and quite often too). In such cases, make sure your sentences and paragraphs aren’t too long, and your readers will still be fine! You can make a text much more readable by using proper transition words (or signal words, same thing). Transition words are words like ‘most important’, ‘because’, ‘thus’, or ‘besides that’. They give direction to your readers. These words give a signal that something is coming up: if you’re summarizing, you’ll use first, second, third, etc. If you want to contrast you’ll write same, less, rather, while or either. If you want to conclude, you’ll use hence, consequently or therefore. At this moment it’s fully available for English and German, and partly available for all other languages. Writing readable blog posts is important If you want your readers to read your entire blog post, you should make sure that your text is easy to read. Don’t make a text more difficult than necessary. Avoid long sentences and write clear paragraphs. Tools like Grammarly and Hemingway can help you to write a readable text. And, if you use our Yoast SEO plugin you’ll get a readability check on your content as well. That way, you’ll be able to check whether your text is SEO friendly and readable at the same time!